The HPMIXED procedure handles only a subset of the analyses of the GLIMMIX procedure. However, you can use the HPMIXED procedure to accelerate your GLIMMIX procedure analyses for large problems. The idea is to use PROC HPMIXED to maximize the likelihood and produce parameter estimates more quickly than PROC GLIMMIX, and then to pass these parameter estimates to PROC GLIMMIX for some further analysis that is not available within PROC HPMIXED. 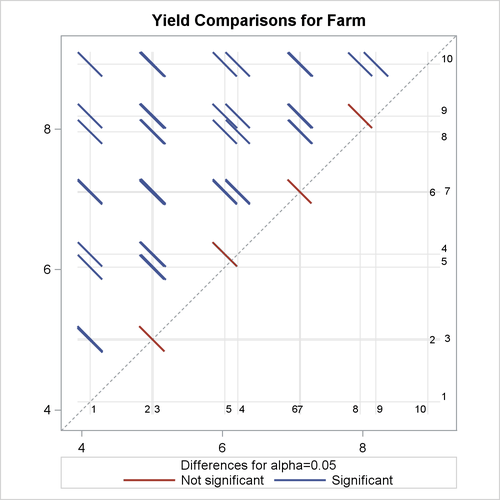 Note that in the preceding DATA step program, certain pairs of farms are simulated to have the same effect on yield. Suppose that your goal is to determine which farms are significantly different. While the HPMIXED procedure has an LSMEANS statement, it has no options for multiple comparisons. The following statements first use the HPMIXED procedure to obtain the covariance estimates, saving them in the SAS data set HPMEstimate. Then the GLIMMIX procedure is executed with the PARMS statement to initialize the parameter values from the data set HPMEstimate and with the HOLD= and NOITER options to prevent further optimization iterations. The LSMEANS statement is used in PROC GLIMMIX to perform multiple comparisons of the LS-means for farms, and the results are displayed as a so-called diffogram. The iteration histories for the two procedures are shown in Output 48.3.1 and Output 48.3.2. Whereas PROC HPMIXED requires several iterations in order to converge, PROC GLIMMIX “converges” to the same value in one step, with no iteration since the options HOLD= and NOITER are used. The graphical multiple-comparisons analysis for the LS-means of farms is shown in Output 48.3.3. It confirms the pairwise equalities between farm effects with which the data were simulated. For more information about the interpretation of the LS-means difference plot, see the section ODS Graphics, in Chapter 43: The GLIMMIX Procedure.